Unmanned aerial vehicles (UAV’s or drones) have multiple applications for landscape architects, from early efforts like site analysis to creating awareness and excitement for a completed project. Although semi-professional drones are now readily available and inexpensive, there can be a heavy investment of time needed to create a quality product. Landscape Architects will need to evaluate the resources necessary to perform drone operations directly or consider hiring professional drone pilots for their projects. Either way it’s important to understand safety requirements and regulations related to flying drones on a project site. Rules for hobbyist differ from those operating commercially, and it’s critical to understand these differences before implementing drone use in your practice. Per FAA requirements this includes (1) Learning the Rules, (2) Pass the Remote Pilot Exam (Part 107, certified drone pilot) and (3) Registering your Drone with the FAA. Online aerial mapping programs (like Google Earth) are an excellent tool to help landscape architects and designers understand larger sites and their surrounding context. However, there are limits to these programs including outdated imagery and photo quality that is often inconsistent and lacking detail. Drone photography can significantly increase image quality while also providing current documentation of existing conditions. With additional customization and software, the landscape architect can also prepare scalable aerial maps used for early site planning and exhibits. In 2017, Studio DPA conducted a visual assessment of a 25-acre site in Phoenix, Arizona. The property was previously a citrus farm and palm tree nursery with a number of structures on the site including a ranch house complex, irrigation canals, and agricultural equipment. The developer and project team were interested in documenting these existing features to help further inspire the design theme, including reuse of many materials found onsite. A drone was used to capture aerial footage of the property then combined with ground level shots to make a 4-minute video summarizing the results. Access to high resolution aerial imagery captured during construction can provide the design team the latest conditions on a site. The landscape architect can verify installation against the proposed design or identify potential conflicts early in construction. We’ve noted general contractors and surveyors are increasingly relying on drones to provide mapping services for a property. 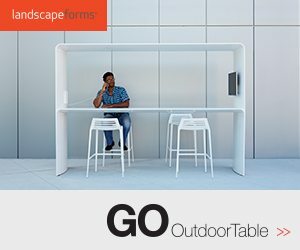 The potential for landscape architects to employ similar mapping techniques is compelling. 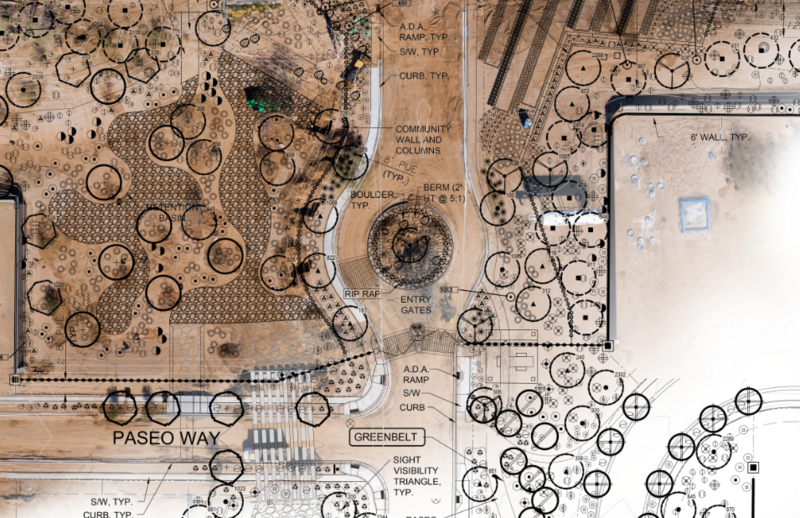 Although UAV technology can’t replace the skill and experience of an in-person site review, the ability to map a completed landscape installation to verify quantities and layout is promising. This can be an efficient solution to an otherwise laborious task. Perhaps the most compelling use of drones in landscape architecture is bringing awareness and excitement to a project, as well as the profession. This can begin in the early stages of a project and continue well after completion. The full scope of site improvements can now be captured in a manner that was difficult or costly prior to drones. High resolution imagery can show in detail a connected network of open space, trails, gathering spaces and other site improvements. 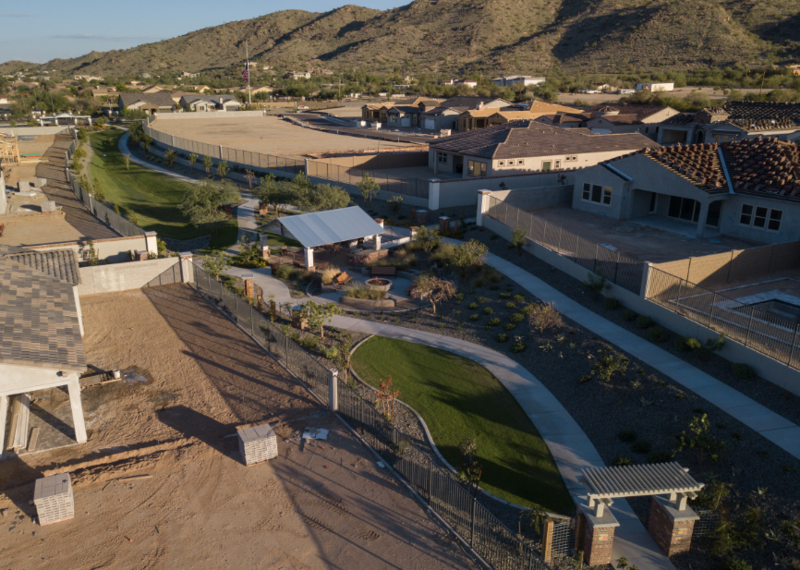 Studio DPA recently completed a project video highlighting the landscape architectural improvements at the Navarro Groves master planned community in Phoenix, AZ. 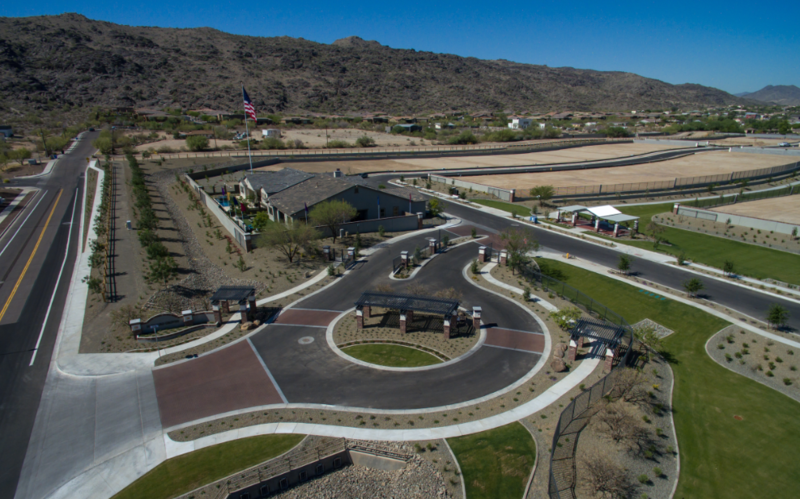 The video features the entry monument, ramadas, green belts, trails, gathering areas, a fire pit, and new planting. 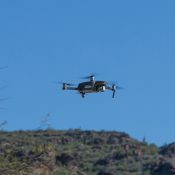 This is the same project highlighted earlier and demonstrates the full range of drone use in the life cycle of a project. UAV imagery has the ability to capture in scale and context the meaningful impacts we have on land development projects. The drones birds-eye perspective seems like a natural fit for a profession that seeks to “analyze, plan, design, manage, and nurture the built and natural environments”. All of which can help the design team and stake holders visualize a more holistic view of our contributions as landscape architects. Review and understand FAA requirements for commercial drone operations. You need a Part 107 license from the FAA to fly a drone commercially. To protect your landscape architecture practice, consider liability insurance covering bodily injury and property damage. Learn the mechanics of flying your drone first, then focus on your aerial photography skills. YouTube is a great resource for tutorials on both topics. We utilize DJI Phantom and Mavic drones, but there are a number of manufacturers in the market worth considering. Photography and mapping are great uses for a drone but video can provide a more dynamic viewing experience. Learn video editing skills with programs like Adobe Premiere Pro, After Effects, or Final Cut Pro. Check out our YouTube Page for more examples of how drones can be used in the profession.